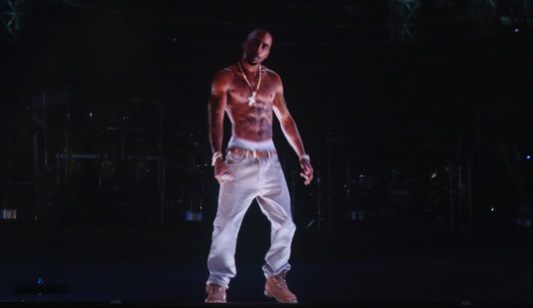 Tupac died 15 years ago, but through the magic of Pepper’s Ghost, the crowd at last weekend’s Coachella music festival in California got a chance to be simultaneously thrilled and weirded out by a rapping, walking, and talking Tupac, who “took” the stage with his former running mate Snoop Dogg, aka Snoop D-O Double Gizzle. Below is a probably NSFW [language] video of the performance, and honestly, it does sorta trick you into thinking Tupac is actually there. Snoop plays his part in the ruse, ably rapping alongside his slain friend, though I’m sure that, thanks to the marijuana, Snoop has rapped with ghosts before.